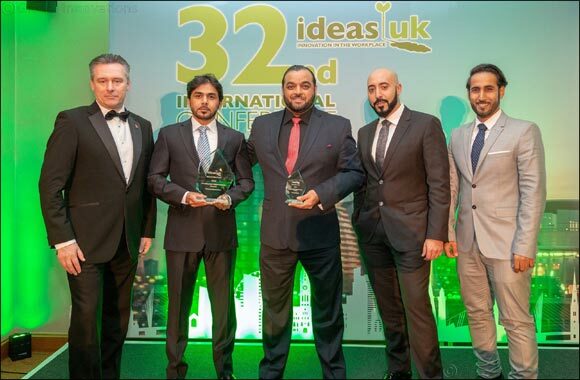 Dubai, UAE: 5th December, 2018: Dubai Customs bagged three awards at the latest Ideas UK 32nd International Conference 2018, held in Manchester, UK. The Department won the Platinum Accreditation for the ninth year in a raw, scoring 100% for the sixth consecutive year, the idea of the year for The Advisor (World's First Customs Training and Explosives Suitcase), innovated by Mohammed Al Khinjari, and a shield for the X-Patrol (Middle East's First Customs Patrol Vehicle), by Saeed Al Katbi. Ahmed Mahboob Musabih, Director of Dubai Customs, said: “At Dubai Customs, we keep abreast with the latest technologies to turn our workplaces into innovative spaces inspired by the vision of His Highness Sheikh Mohammed bin Rashid Al Maktoum, Vice President and Prime Minister and Ruler of Dubai. These innovative winner ideas show our prudent leaders’ interest in driving everyone towards innovation and turning Dubai into the smartest city in the world. We raised the bar high as bigger commitments now are laid on our shoulders to meet the objectives of the UAE Centennial 2071 project, prepare ourselves for the EXPO 2020, and actively participate in the 4th industrial revolution. We expect Dubai to turn into an international hub for innovators and inventors thanks to the big efforts and support to innovation and scientific research in the country” Musabih added. “These prestigious awards we received from Ideas UK is an indication of our commitment to nurturing a solid culture of innovation and creativity within our workplaces, so as to keep pace with the vision and aspirations of Vice President and Prime Minister and Ruler of Dubai His Highness Sheikh Mohammed bin Rashid Al Maktoum, which drive us to ensure that ‘Innovation is a daily government practice and not just a transient event. This vision will enable us to turn a generation of ideas into an organizational process within all governmental departments, which will help us as well achieve our own goal of becoming the leading customs administration in the world supporting legitimate trade”. Hussain Al Fardan, Senior Manager of Dubai Customs Innovation Center said: “These three awards have added up to a bright record of accolades won by Dubai Customs in different fields. Thanks to the close follow up of the higher management and their encouragement and support, we are getting closer to materializing our vision of becoming the world leading customs department. We continually develop the competencies and skills of our employees and encourage them to think out of the box. Innovative ideas boost production which leads to a better growth in trade. They can also support the emirate’s competitiveness internationally”.